The individual retreats are ‘individual’ in the sense that you can come alone and start on whatever day of the year – just when you need it – and the attention you get is personalized. We will look at your yoga level and needs, your dietary needs or wishes to learn about food and health. Then in your private sessions we offer you personal guidance. Our name for those retreats is “Escape without running away”. We offer two different one-week packages. For price information and further detail see Retreat Packages. They consist of one or more weeks in Majorca, with therapy or less intensive coaching in combination with yoga instruction. We are totally committed to this approach, which we call the ‘varied path’ to a personality. The yoga, meditation and the individual sessions complement each other. 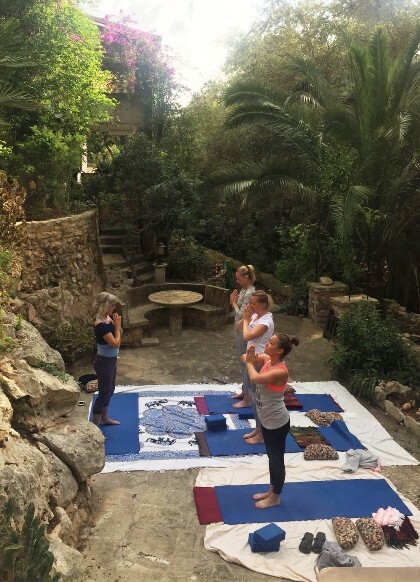 You do not necessarily have to talk a lot, or come with a ‘problem’, insight can be joyful…..
Aleid gives yoga sessions in small groups 2-5 people at a time and of the individual coaching / therapy, preferably outdoors as soon as the sun is out. Doby supports everybody with healthy tasty vegetarian world food, a good chat and laugh, music, and massage or reiki. All this happens in a homely atmosphere, with space to retreat or to be sociable whenever you want. Our guests have their own bedroom and bathroom, and the garden and surroundings offer plenty of space to relax.